The art doll to emerge this week from my studio is this whimsical figure grasping the string of her balloon. I like working on pieces in which I strive to capture movement. It is easier to have a sculpture posed in a static attitude. 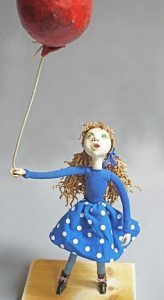 With this doll, I wanted the viewer to feel if they could witness the very next second, the doll would either rise off her one foot, or be running after the balloon being carried by a breeze. Some pieces take form as you are working on them, sometimes surprising you with the end result. This piece was very much the opposite. She was fully formed in my mind and sketchbook just begging to come to life. The only detail that surprised me was how I created the balloon. 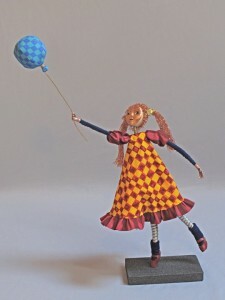 Originally, I was going to fashion it out of something like paper mâché, but then I found the blue checkered fabric in my stash, and it spoke so strongly to the pattern I chose for her dress. I knew I had to sew it as well. Her red “leather” Mary Jane shoes took me on a little learning journey. I find I simply love creating the footwear for these figures. I helped my process of creating the patterns for each by doing a bit of Internet seachring on shoemaking itself. Watching footwear pattern and construction videos during a gallery shift provided fresh insight. Most helpful was seeing how shoe designers use tape covering their shoe form to create their initial patterns. I think I might have found my image piece for my next show card. This entry was posted in Art Dolls and tagged art doll, balloon, copper, figure, figure sculpture, sculpture on March 15, 2015 by lynnadmin.